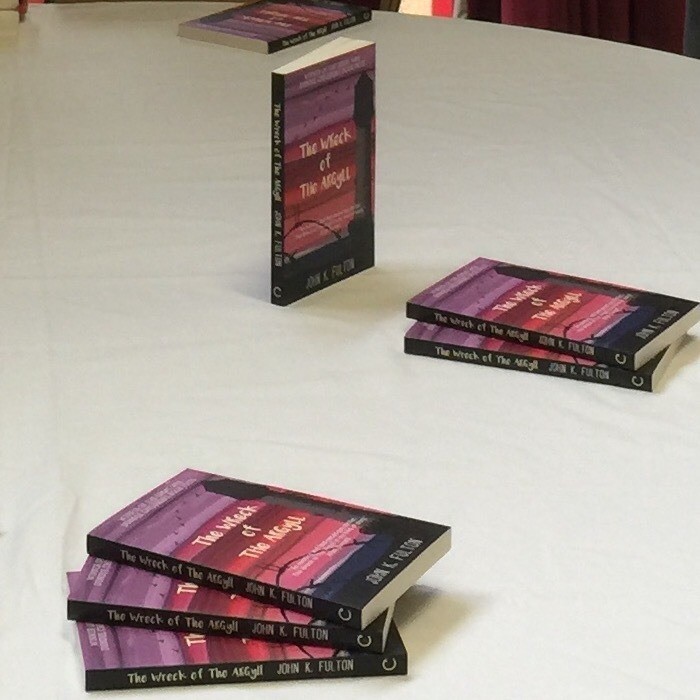 Friday, 25th September, 2015, was the big day – the day my first novel, The Wreck of the Argyll, was launched. My partner Sandra and I made the 400-mile trip up from Leicester the previous day – we usually drive up to Dundee about once a year, but this year we’ve become a bit more familiar with the journey. It’s tiring – but it was worth it. We spent a lazy morning in bookshops (where else?) and somehow managed to come away from Waterstone’s and the fantastic Oxfam charity bookshop on Reform Street with about a dozen books – then we had a leisurely lunch, and set off for the launch event in plenty of time. We’d even scouted the route to the West Park conference centre that morning. We hadn’t factored in the horrible Friday afternoon traffic on the Kingsway, though, so Fiona Macpherson from Dundee Libraries looked a bit worried when we finally turned up with just five minutes to spare! After that, the event went very smoothly. Judy Dobbie from Dundee Libraries introduced the proceedings, then Mr Drummond, the chair of the First World War Scottish Commemorations, spoke. The launch of my book was tied into the commemorations for the centenary of the Battle of Loos, with Dundee at its centre. He seemed to have enjoyed the book, too, which was gratifying. Then Amina Shah, CEO of Scottish Library & Information Service (and formerly of Dundee Libraries), who’d been involved in the project from the beginning, said a few words. I think she’s pretty proud of what her former colleagues in Dundee have achieved. Helen Sedgwick from Cargo Publishing then spoke about Cargo’s role. I loved working with Helen – she edited the book into something I can really be proud of, but more importantly dealt superbly with the nerves of a first time author, from the way she phrased her editorial comments right up to responding to my panicked emails when I discovered bookshops were accidentally sending out the book 50 days before the official release! Then Amy from Braeview Academy, who’d been one of the presenters at the prize ceremony back in March, read chapter 14 from the book. It’s the chapter where the Argyll has hit the reef, and young midshipman Harry Melville is rushing around trying to see how bad the damage is. You could say the chapter is a bit of a spoiler – but no more than the title of the book, I suppose. My first duty was to present Qynn Herd with a copy of the cover art, framed along with her original design upon which Michael Gallacher based the final artwork. I was delighted to do this – everyone who sees the book comments on the gorgeous cover, and that’s down to Qynn and Michael – I just benefit from their talent! Then I had to talk. I’m not good at public speaking. Believe it or not, when I was at school I entered debating and speech-making competitions, but the feedback was alway the same: “Well-written speech, John, but the performance, er, needs work.” If I’m reading from a prepared script, I mumble and rush and fall over my own tongue, so I’d decided to wing it a bit. I’d had a good think about what I wanted to say, though – I needed to thank everyone for helping make my dream come true. It’s not really fair that there’s only one name on the front of the book, when you consider everyone that’s been involved in The Wreck of the Argyll. I’ve tried to thank as many people as possible in the acknowledgements in the book, but who reads those bits? The launch event was the ideal opportunity to let the world know how grateful I was to everyone. 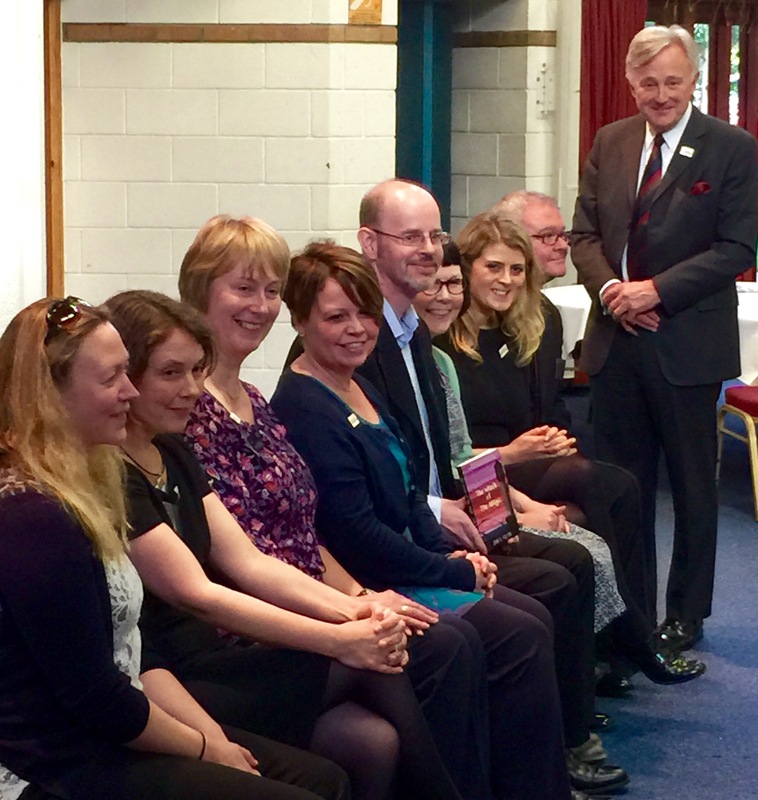 It was also a good time to appreciate how the book was serving a useful purpose in bringing to life the history of the Great War – particularly with all the commemoration events that day for the Loos centenary. I couldn’t do any of it without Sandra, and she knows that, but it was nice to be able to tell the world how much she’s helped, too. 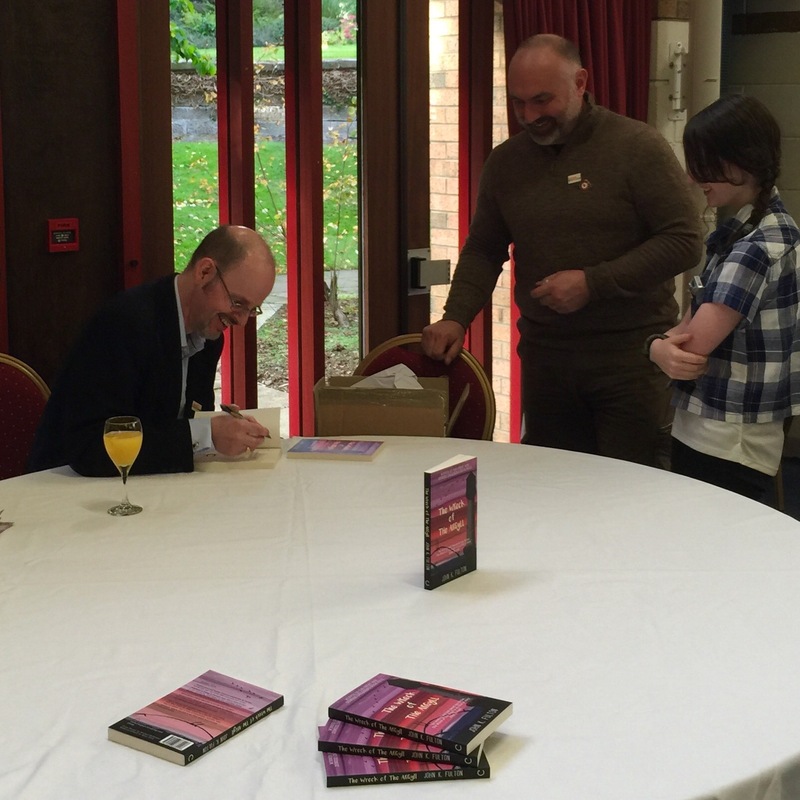 I hate public speaking, so I was glad when it was over, but more glad that I’d been able to thank the people who’d done so much for the book. But then came my second most hated thing – photographs! At least I had company for some of the photographs. It was lovely to catch up with Joe Lamb and Lindsay Littleson, too, the other finalists from the competition. I hadn’t seen them since March, but we’ve been keeping in touch through email and Twitter. Eventually the queue of people dried up, and it was time to leave. It was an amazing experience – one that I never actually thought I’d have, particularly not in the dark days of endless submissions to agents and constant rejection. I’m not a believer in the power of positive thinking – I’m way too gloomy for that – but I am a believer in not giving up. So there it was. My first book published, out in the world, being read and (hopefully) enjoyed. Enough people have asked about a sequel that there’s just a glimmer of hope that I might have a future in the writing business – you can sometimes con people into reading one book, but it’s difficult to convince them to read another if they didn’t enjoy the first. But that’s for another day. Launch day belonged to The Wreck of the Argyll. Congratulations on the publication and release of your first book John. Hope you have more stories in you and I’m sure you will have a great future in story writing. Well done John – bet you’re glad you didn’t give up! That’s good staying power mate – enjoy :).